Swiss Chard, also known as Chard, Silver beet, Perpetual Spinach and Spinach Beet. It is a leafy green vegetable that can grow more than two feet tall and two feet wide. Similar to spinach and beets with a flavor that is bitter, pungent and slightly salty. The leaves, of all varieties are a shiny dark green color, ribbed and with a crinkly texture. They vary in color, depending on variety, ranging from light green and white for the most common to different shades and combinations of orange, purple yellow and red in the more colorful varieties. Swiss chard will produce over a long period of time and unlike many other vegetable greens is quite tolerant of hot summer conditions. The colorful varieties of Swiss chard are often used in flower beds and ornamental pots where they bring welcome color to the garden early in the season. However these colorful varieties dont produce as well or are as resist to bolting as the more common green varieties. While Swiss chard is classified as a Cool season vegetable and grow best in cool weather, it does well in a wide range of conditions including light frosts. Air temperatures of 55-70 F (13-21 C) are ideal for growing Swiss chard and in some areas with warmer winters, will continue to grow right through. Swiss chard like a sunny position but welcomes shade in the hottest part of the season. 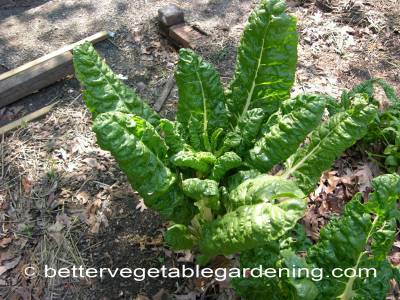 Chard requires a minimum of 3-4 hours of direct sunlight daily to produce at its best. Swiss chard, like most leaf crops, love organic rich soils, loose and well drained and, if available, lots of animal manure and compost. A low soil pH will result in poor growth when growing Swiss chard, a pH of 6.2 to 6.8 is good but will also tolerate a pH higher than that. Swiss chard seeds germinate best in soils around 65-75 F (18-24 C). and generally take 5-16 days to show itself above ground. Swiss chard seeds, like beet seeds, are a cluster of several seed pods and will usually produce more than one plant per cluster, so planting seeds thicker within the row than mentioned is not usually necessary. Firm the bed after planting and protect from sun and heavy rain with light mulch or a board. It is better to start early spring sowing indoors in colder areas, For more details on starting seeds indoors click this link. 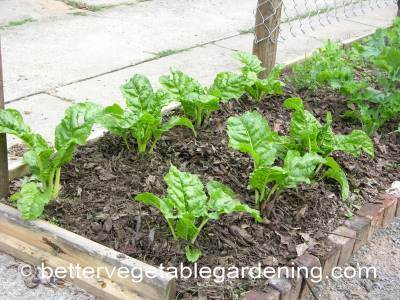 Direct sowing Swiss chard seeds; 1/2 inch (12 mm) deep, 4-6 inches (10-15 cm) apart in rows 12-18 inches (30-45 cm) apart. 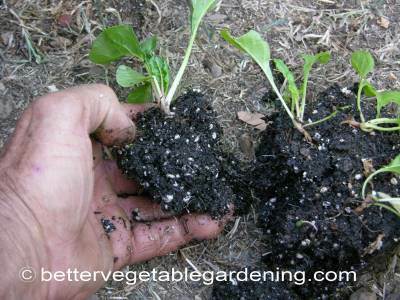 Transplant or thin seedlings 10-12 inches (25-30 cm) between plants in rows 12-18 inches (30-45 cm) apart. 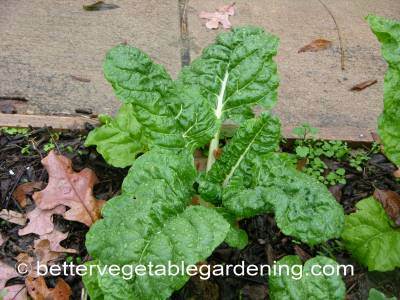 Transplant Swiss chard plants to the garden at 5-6 weeks from germination. There are two ways to space the plants. Space the plants 10-12 inches (25-30 cm) apart within the row, with rows at 12-18 inches (30-45 cm) apart. Or, plant them 4-6 inches (10-15 cm) apart in the row and then, when they are approximately 6-8 inches (15-20 cm) tall, thin the plants by harvesting them as whole plants, leaving the final spacing of 10-12 inches (25-30 cm) between plants. Much like beets, when growing Swiss chard, ensure to keep the soil moisture consistent, especially during the early part of their development. Too much water as seedlings can result in "damping off". Using mulch on the garden will help regulate soil moisture and control weeds. 2 weeks before sowing or transplanting apply 3-4 quarts per 100 sq feet (3.3-4.4 liters per 9.3 square meters) of All-Purpose 5-5-5 Organic Fertilizer. When transplanting use liquid starter fertilizer. Side-dress every 3-4 weeks using the same rate as the initial application. Beets, spinach and Swiss chard are all in the same family and although usually they are not bothered by serious diseases, crop rotation is still a good practice. Plant with beets and carrots following Brassicaceae crops. Aphids, Leaf Miner and Slugs. Usually no serious diseases bother Swiss chard. 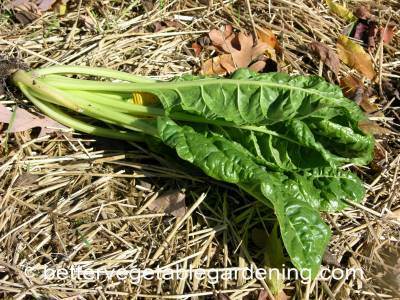 Chard can be harvested at any time after the leaves develop. The whole plant can be harvested at once by either pulling the entire plant or cutting it off at ground level. Or leaves can be harvested as needed leaving the plant to continue growing. Harvesting Swiss chard by this method will yield a continual crop throughout the growing season. For the short term Swiss chard should be stored at 32 F (0 C) and relative humidity of 98-100 percent. In ideal conditions chard may last up to 2 weeks. 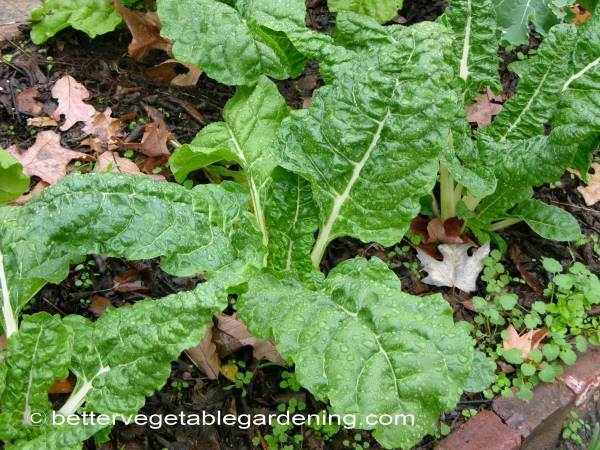 Swiss chard will both freeze and can very well.